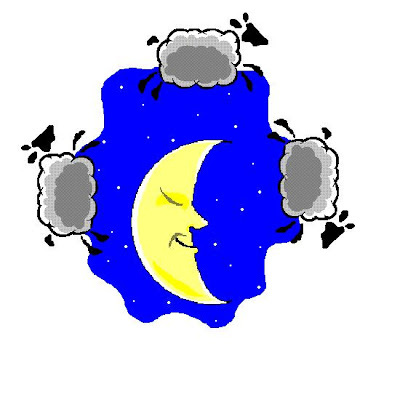 Why is insomnia a part of menopause? Is it because then in the middle of the night when I wake up in a blanket of sweat I can think? No good thinking comes about at 4AM. I know. I have been up thinking at 4AM too many times. Last night, I willed myself not to think about my Aunt so instead my mind wandered to the absurd. I worried about missing my last two dentist appointments. I worried about forgetting to return important e-mails. I worried about Kyle's stupid SAT. I worried about not sleeping. I worried about worrying. I would have been better off thinking about my Aunt. Now, I'm exhausted and not sure how I am going to get through the day. But I will. It won't be pretty but I'll manage. I just don't understand why this estrogen thing has to be related to sleep disturbances. When we are tired everything seems so much worse. And I don't need things to seem worse right now. Hence, I worry about not sleeping. So many of my friends function wonderfully on only a few hours of sleep a night. I don't. I need a solid seven or eight hours. Sleep has always been a problem for me. Even before this wonderful time in my life I had a difficult time sleeping. But never like this! I am so envious of my husband who puts his head on his pillow and is immediately fast asleep. I listen to his breath for hours tossing and turning until I finally fall asleep. Then just a few hours later I wake again. Shake the sweat from my burning body and try again. He always tells me to get up and read or something. BUT, I don't want to read. I want to sleep. I love the feeling of a good night's sleep. The restful, calm way you go about your day. I love the extra patience I have when I am fully rested. Everything is more fun, makes more sense, brighter, fuller, more engaging when I have had the proper rest. I remember feeling that way back in my mid-forties. It was wonderful. I am reading so many wonderful blog posts from new mothers. How I remember those sleepless nights. And then right when you think you can't take it anymore, your precious child finally sleeps through the night. Do you think that will happen with me? Do you think that when I finally just can't deal, my hormones will settle down and I'll be able to sleep once again? Does anyone have any good sleeping tips? I desperately need advice. Broken sleep is the worst! I have given up on ever getting an entire night's sleep again. I can usually fall asleep again though, without too much trouble. Are you a sports fan at all? I find when I go through the entire St. Louis Blues roster from 1967-I am out like a light before I even get halfway through. My kids are a big fan of the Sleepytime Tea from Trader Joes.